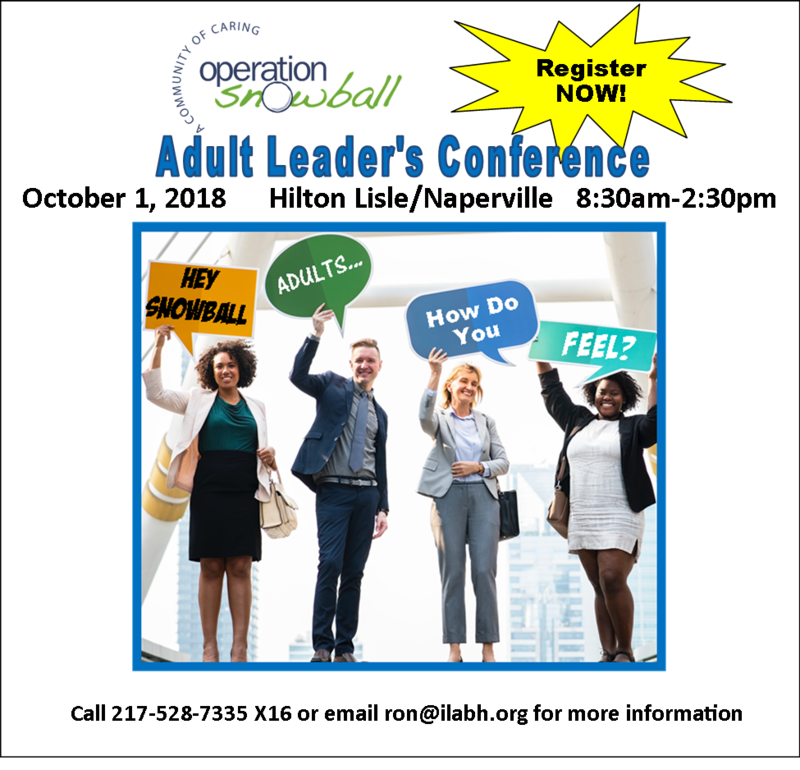 Operation Snowball Inc. in partnership with the Cebrin Goodman Center invite you to attend the Adult Leader's Conference. Plenary session by ‘Leading To Change’ founder Eric Rowles. 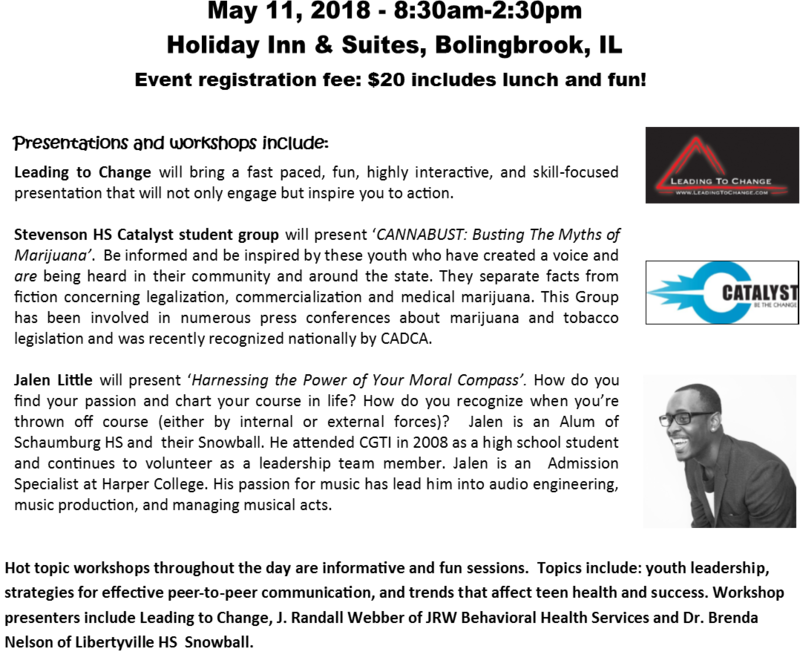 Breakout Sessions with topics such as youth leader training; prevention strategies and trends; program evaluation; and more! Adults who are coordinators, adult group co-facilitators, volunteers and supporters of their ‘Snow’ program. All are invited! Schools with a Goodman prevention grant. CGTI adult mentors implementing their CAT plan. Ideas, resources and strategies to take back to sustain and grow your prevention activities. Learn from, and network with, your Snowball peers from around the state. Chapters asked for it, OS Inc. is bringing it! BTW: Adults need a Snowball event too, right? Q: I understand this is an adult leader's conference. Can I bring my youth directors? A: Not for this event. Operation Snowball is scheduling regional trainings that youth directors and youth discussion group leaders can attend in the near future. 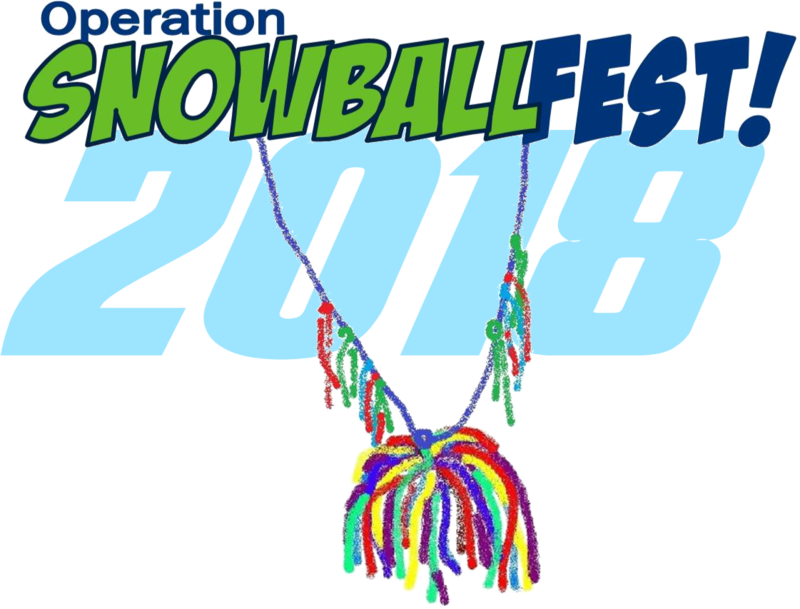 We will also have SnowballFEST! 2019 in April '19 for everyone to attend! Q: How many adults can a Chapter bring? A: That is up to you! The Hilton's conference area that we have reserved can hold a lot! Q: Do those attending have to be school or agency employees? A: No! This is open to ANY adult who is part of Snowball and/or Snowflake, so if you have volunteers who are parents, police officers, etc. that are involved in your Snowball please extend an invitation to them. We want you to come with those that will enjoy, learn, share and take back info to make your events event greater! Q: What if I am not part of a Snowball but I'm involved in prevention with youth? A. Come! This is a great event if you are working with youth as part of a DHS/SUPR grant's Youth Advisory Committee or you have a Goodman Prevention grant. Those interested in starting a Snowball Chapter are welcomed too! Q:What is the difference between the paper registration and the electronic registration? A: The electronic form allows you to register and pay online with a credit card. Some schools and agencies do not allow for electronic credit card payment so the paper form can be turned into your business office and a traditional check can be issued and mailed to our office. Please be aware that registration need to be in our office Sept. 20th at close of business 5pm. (Our mail is usually delivered by 1pm daily...just sayin'). Q: I have numerous people at my Snowball/Flake that want to go...how do I pay for all of them in one transaction? A: Each person should fill out a paper registration and when you have everyone set and want to make one payment, call us and we'll assist you keeping the process simple. We can assist with both electronic and paper registrations of this nature. Call Ron at 217-528-7335 X16 or email him at ron@ilabh.org. Q: I see lunch is included but I have a special request, how do I let you know? A: The registration form asks that question but we'd be happy to talk to you directly if you need reassurance that we understand your needs. Come join us for a day of Celebrating Snowball's 'Community of Caring' with speakers, workshops awards, lunch and fun! Last year over 100 registered for SnowballFEST! and it was awesome! This will be AWESOME-ER! (Yes, we made that word up!). MULTIPLE DATES! MULTIPLE LOCATIONS! APPROPRIATE FOR ANY YOUTH LEADERSHIP GROUP! These workshop are designed with youth leaders in mind. We encourage any school/community group that utilizes youth to facilitate, present, mentor and lead their peers in creating positive change in their school and community to attend our workshops. Adult leaders should attend but we encourage bringing youth in order to maximize the leadership experience. Please contact the Operation Snowball Inc. office if you are having trouble with registering or have questions about the registration process. Q: Is this only for Snowball youth leaders? A: No! Any organization, high school school or coalition that utilizes youth leaders involved in prevention activities can attend. If you have youth leaders that have discussions with their peers about drugs and underage drinking and/or mental health issues such as depression and anxiety these trainings will be awesome! Q: Is there a fee? A: Yes. Snowball Chapters have a reduced fee of $40 per person to attend. If you are not affiliated with a Snowball Chapter is is $60 per person. Same price for youth and adult. A: Training from an expert in the field of ATOD and mental health (who are also former Snowball and teen institute leaders... i.e. 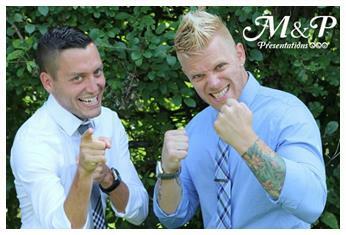 they understand youth prevention leaders!). Materials and lunch are included. Q: Is this going to be fun for my youth leaders? A: Yes! The event will have moments of of facts, figures and debunking myths so everyone has current accurate information about the topic with time devoted to interactive activities to learn how to facilitate discussions about these important topics. We want to increase knowledge of facts and communication strategies in a fun, safe learning environment. A: No, all participants are responsible for arranging their own transportation and associated fees when applicable i.e. train fares, parking, etc. Q: If I'm an adult can i attend without youth? A: Yes, you will have some information that you can take back however the training is designed for youth to increase their knowledge, learn new strategies and have some fun practicing through interactive activities. It is recommended that adults bring a group of youth to maximize the leadership experience. Youth Leaders (and adult leaders) involved in prevention are invited to attend this training that will increase youth leaders knowledge about marijuana and other drugs with current accurate information about how these drugs affect youth's health and success. Youth leaders will also learn facilitation strategies and activities in increase their effectiveness in formal and informal settings when discussing the topic of marijuana and other drugs with their peers. Workshop presented by J. Randall (Randy) Webber. Randy has been an expert in the field of addictions for decades. He holds a Master's degree in Public Health. Early in his career he was involved in Operation Snowball and the CGTI (then called ITI). He is the principal at JRW Behavioral Health Services. He is a well known expert in the field of addictions and a sought after presenter and trainer. 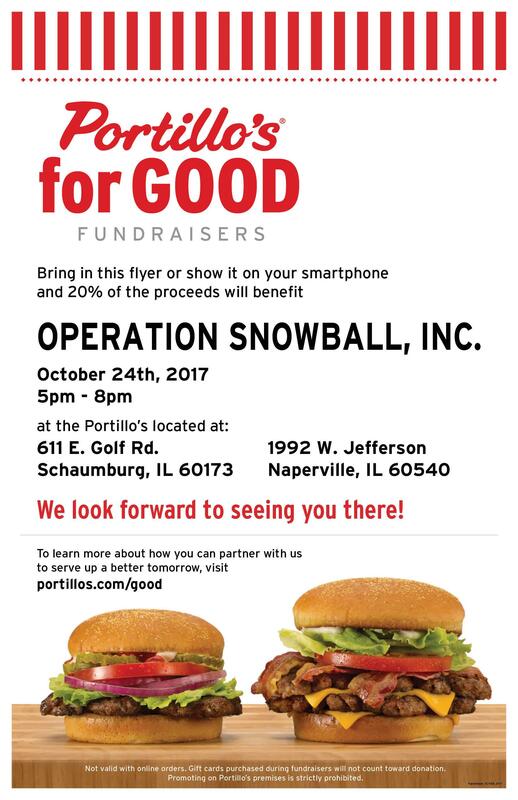 Celebrate Operation Snowball at Portillo's Hot Dogs on Oct. 24, 2017 and Raise Funds for OS Inc. The Board of Director of Operation Snowball Inc. wants you to celebrate Snowball during Red Ribbon Week by coming out to Portillo's on Tuesday October 24th. Two locations, Schaumburg and Naperville Portillo's, will donate 20% of the dinnertime sales to Operation Snowball Inc. (see details and flyer below). So put on your favorite Snowball/Snowflake shirt, gather some friends and family and celebrate prevention and Operation Snowball! Don't forget a warm fuzzy! Looking for New Discussion Group Activities? The next time you are searching for new discussion group activities for your Snowball and Snowflake try a google search by topic instead of the cliche 'Team Building' or 'Group Games'. Here is a great toolkit of activities based on 'Empathy'. The website Startempathy.org also offers this toolkit in Spanish. You will find that this collection of activities can easily be adapted for the Snowball and Snowflake discussion groups. Make finding new discussion group activities/conversation starters a challenge for your youth leaders. This is great 'outside-of-the-box' skill development. Assign leaders a topic to search and then in your next meeting review, discuss and plan on how to train others on these new finds! Search topics such as 'activities that teach' : empathy, conflict resolution, consensus building, healthy relationships, citizenship, volunteerism, drug prevention, and career planning. You'll be amazed at the number of activities and Youtube videos that result in your search! We would love to hear from you about resources you've discovered so we can pass them along to other Snowball Chapters looking to enhance their facilitator trainings and event's discussion groups! OS Inc. Wins the Mike William's Logo Contest for August. Receives $1000 Donation! 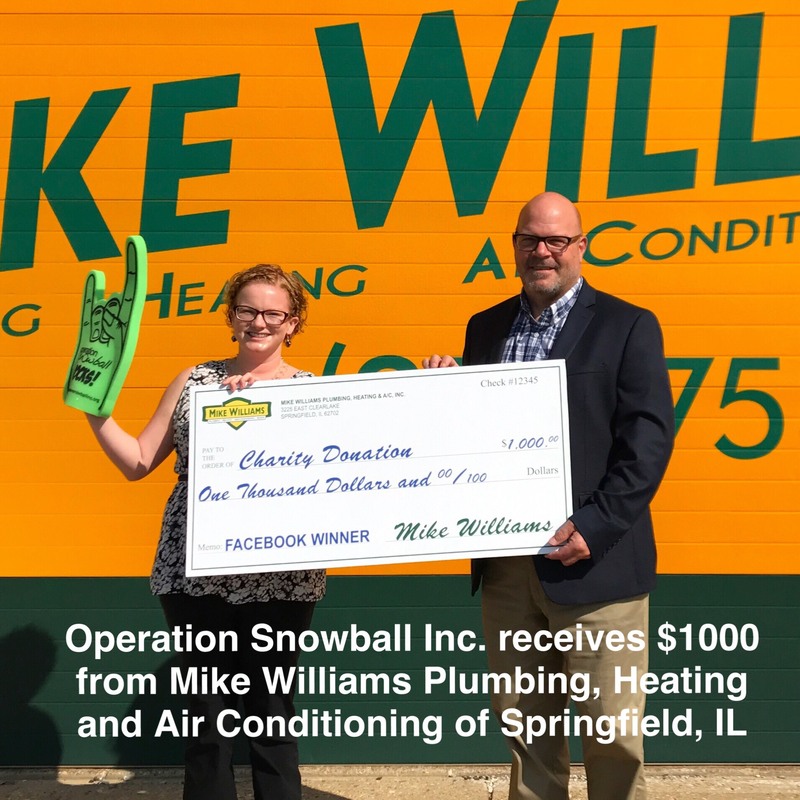 The Springfield-based company: Mike Williams Plumbing, Heating and Air Conditioning, holds a monthly logo contest for non-profits. The most 'vote-getters' receives a $1000 donation. Thanks to all of our Snowball Chapters and friends of Snowball we were the winner for August. The added bonus is that this donation will be matched (2x) by the Lillian and Larry Goodman Foundations! We'd like to express our gratitude to Mike Williams Plumbing, Heating and Air Conditioning! They exemplifly 'community support' as they hold this fun contest monthly for non-profits throughout central Illinois. They not only help with a donation but their contest increases awareness about OS Inc. and other non-profits that serve the community. Make sure to visit our facebook page and twitter feed to give a thumbs up to our posts thanking Mike Williams for their generousity and community support. (event has closed)OS Adult Training Event: "Marijuana and Illinois: Pot's Impact on the Land of Lincoln"
Attention Snowball adult leaders! Gain information and insight to prepare your youth leaders and inform Snowball participants about the multi-faceted issues concerning marijuana today. This is a hot topic training led by the national organization Smart Approaches to Marijuana (SAM). Don't miss this opportunity! This Illinois Association of Behavioral Health training is sponsored by Operation Snowball Inc. with a reduced price for Operation Snowball Chapter adult leaders. The volunteer Operation Snowball Board of Directors is kicking off the Operation Snowball Summer of '17 fundraising campaign from July 7th - July 21st. As our new fiscal year began on July 1 we reflected on our successes in the past year, but also acknowledged the reality of financial stressors created by state budgets and shrinking funding sources. In order to meet our mission of Operation Snowball we rely on the support of Illinois state prevention grants as well donations from foundations and dedicated individuals like you. Your donation is met by a generous match by the Lillian and Larry Goodman Foundations. Your donation is tripled... $25 becomes $75... $50 becomes $150... and so on! Thank you for your support! 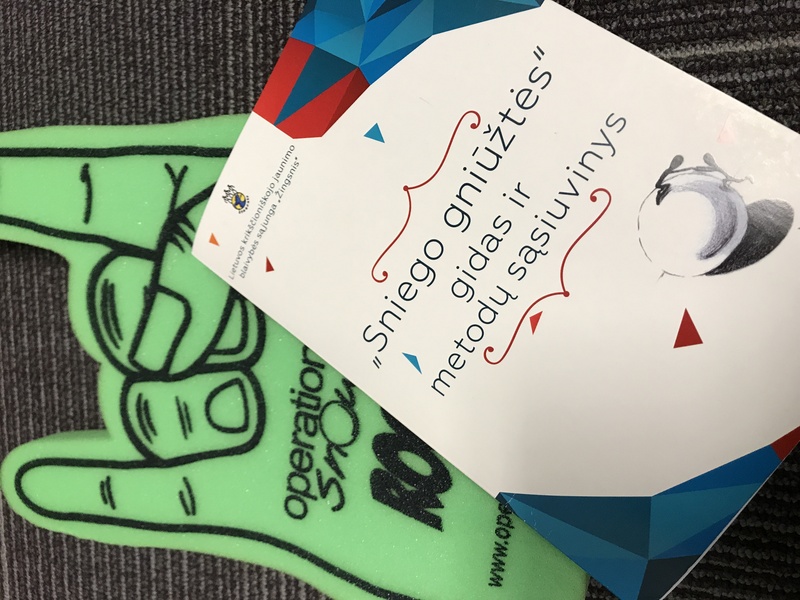 The OS Chapters in Lithuania take pride that all of their 35 Chapters of Snowball follow the standards and guidelines using the OS Manual. Making sure all leaders utilize this manual is very important to them in preserving the mission of Snowball throughout Lithuania so the manual was translated into the Lithuanian language! Click here to take a look at the manual. Although in a different language, it is fun to look at the songs and activity section on pages 43 - 46 as you will recognize 'Boom Chicka Boom', 'Snowball Monkeys', 'Singing in the Rain' and other Snowball songs! 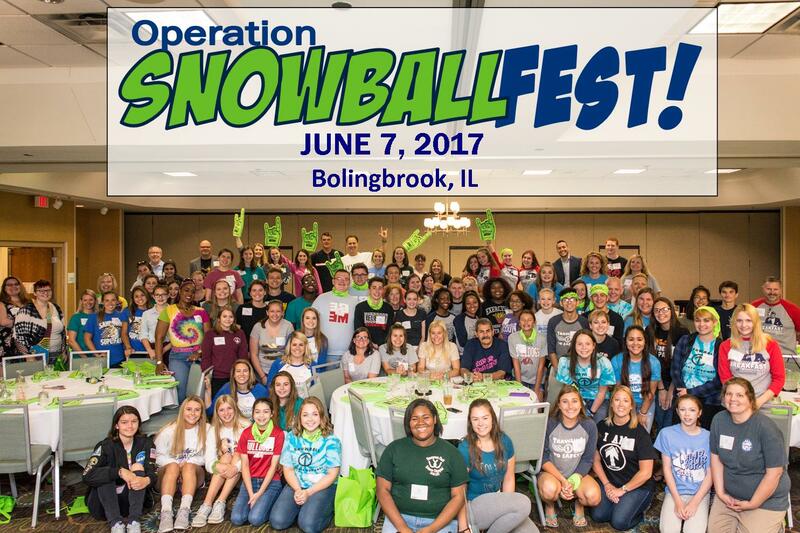 Operation Snowball Inc. held its last training event of FY17 on June 7th in Bolingbrook IL. SnowballFEST! was attended by 15 Chapter’s youth and adult leaders, the furthest coming from Springfield and Streator. The 94 guests participated in a team building presentation by M and P Presentations LLC which utilized live Twitter and Instagram group challenges (search #Snowfest17 to see the posts!). Steve Mazzarella, OS Board member and volunteer for Naperville’s Chapter, presented on leadership values and self-worth. This high energy day included OS Awards at lunchtime honoring outstanding youth, adults and chapters and a special surprise of a live Skype call from Lithuania by Darius Zingsnietis who coordinates the 35 Chapters of Snowball that operate there. A great day of skill-building, motivation, networking and celebration. Registration has closed for this event. Walk-In Registrations will NOT be Allowed on the day of event.